Galerius, his laureate head right. holding patera (from which liquor flows) in right, and cornucopiae in left hand. Star in left field, A in right field. dot SM dot TS dot in Exergue. Minted at officina A in Thessalonica (Saloniki, Greece) between December 308 and May 310 A.D.
Sutherland, C.H.V., "Roman Imperial Coinage", Volume 6 (RIC), Thessalonica, p514, nr 30a. hinterlassenen Sammlung und Aufzeichnung des Herrn Paul Gerin" (Voetter-Gerin), Thessalonica, Galerius Maximianus, p334, nr 5. Sear, D.R., "Roman Coins and their Values" (RCV 4th Revised Edition), p314, nr. 3717, variety. 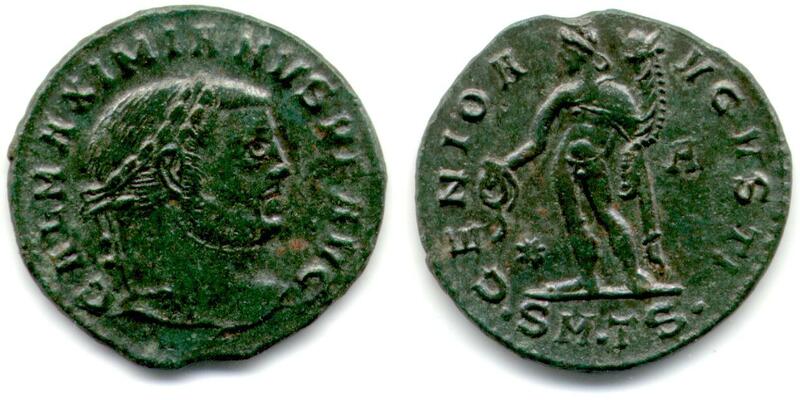 Van Meter, D., "Handbook of Roman Imperial Coins", p281, nr 27a.